This was a week of exorcising demons in Rochester. They were able to defeat The Syracuse Crunch for the first time in six games, and the Lehigh Valley Phantoms on their fourth try. 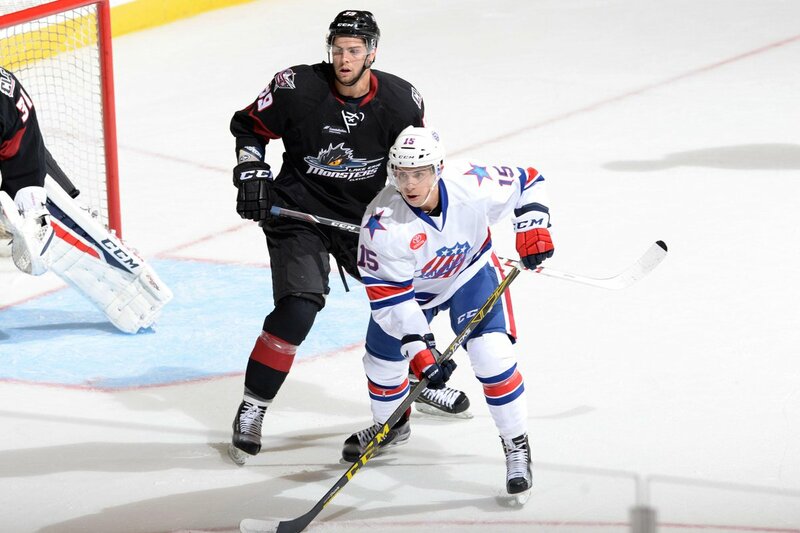 Following the holiday break the new-look Amerks eared six points from four games. This brings them a point above the Marlies into fourth place in the North Division. Utica and Toronto still have a couple of games in hand, but if the Amerks can keep stringing together wins, their playoff hopes look optimistic. Rochester has returned from the break with a new fighting spirit. In the four physically charged games played this week, the Amerks were dealt six fighting majors after only registering nine fights in the first twenty-nine games of the year. Physicality has been a very positive sign for Rochester this year. They are 6-5 in games that feature a scrap, compared to 8-13-1 in peaceful affairs. The addition of Tim Kennedy, and return of Jean Dupuy have seemingly inspired the team to change their style of play. They have been the tip of the spear on the Amerks high-pressure forecheck. Dupuy especially has led by example, finishing his checks in all areas of the ice. This strong play has allowed wingers Justin Bailey and Evan Rodrigues to thrive. Evan Rodrigues rolled up six points (3+3) over the past week. Upping his season totals to 7-12-19. Justin Bailey’s hot streak earned him his second call up of the year. Before traveling to Buffalo on Thursday, Bailey had scored five goals in his last four games. His inability to accurately shoot the puck was one of the main things I judged to be holding him back last year. After hitting a tight window to score on the short side before the break, and scoring on a slick wrister through traffic on Wednesday, he seemed to have made some strides in that department. In a very similar way he has been using his skating ability to stride past defenders. His ability to quickly skate the puck length of the ice is becoming a staple of his play. He gave Syracuse defensemen such a hard time that he drew a number of penalties in an attempt to deal with his speed. However, Bailey isn’t the only speedy winger who has drawn my eye this week. It appears that Evan Rodrigues is finally coming into his own as an offensive playmaker. Rodrigues has always had a hair trigger, but struggled with his shot placement over his first professional season. This weekend he took on the look of a sniper, hitting two posts in addition to his three shots against the Phantoms. Fortunately, he wasn’t striking purely iron. Rodrigues finished with three goals, three assists, and a +6 rating during the four-game stretch. He is also finally taking advantage of his speed outside of his fore-checking game. E-Rod’s ability to skate the puck through the neutral zone is much improved and he is starting to find passing angles to create chances. He dazzled with a couple flashy pirouettes on the rush, finding a teammate with a swift backhand pass on both occasions. I would not be surprised if he finds himself playing with his old college line mate sooner rather than later.